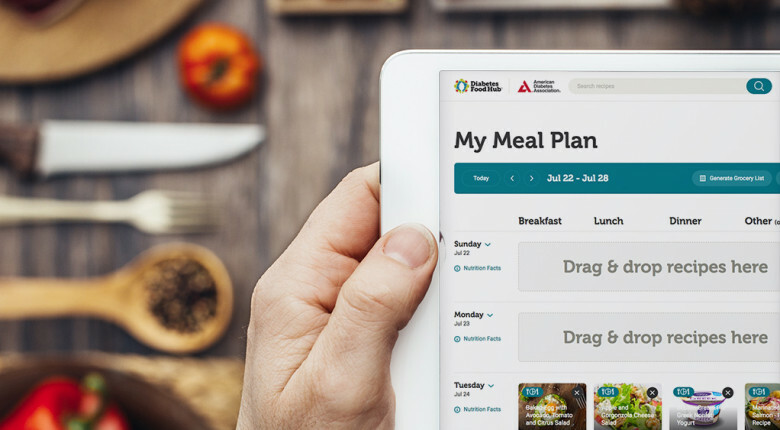 The all-new interactive Meal Planner and Grocery List features on Diabetes Food Hub make planning meals, tracking nutrition, and shopping for groceries a breeze. To make sure you’re getting the most out of these features, try these easy-to-follow tips. First things first—if you have not done so already, create your free account with Diabetes Food Hub. Not only will creating an account let you save recipes, create a profile, and enjoy a more personalized experience on the site, but access to the Meal Planner and Grocery List features requires an account. If you have ever donated to the ADA or volunteered for Step Out or Tour de Cure, you probably have an account with the ADA already and can use that user name and password. Simply log in to the site! If you do not have a username and password, setting up an account is easy. Click on the Menu button in the upper right corner and select “Log In” from the listed options. When the Log In box appears, click on “register here” at the bottom of the box. Follow the instructions and fill out the necessary information—you’re all set! The Meal Planner uses recipes you’ve saved to your Recipe Box for building and planning meals. So be sure to save plenty of recipes in order to have a good selection in the Meal Planner. You can save recipes by clicking the star icon on recipes. You can then view these recipes in your Recipe Box. Be sure to save different types of recipes, such as sides, breakfasts, lunches, and main dishes, so you can build complete meals that meet your nutrition needs. Now that you’ve saved some recipes, it’s time to start building! Your saved recipes will show up to the right of the interactive Meal Planner. (If want to use recipes you’ve Liked instead, click on the drop-down arrow above the recipes.) After that, simply start dragging recipes from the right into the appropriate place on the calendar. That’s it! To review the nutrition information for a day’s meals, click on the Nutrition Facts link to the left of that day and you can see the Calories, Total Carbohydrate, Total Fat, and Protein for each meal and the total for the day. If you make adjustments or swaps, the nutrition information will recalculate automatically! Once you’ve built out your meal plan, you can make shopping a snap by clicking on the “Generate Grocery List” button at the top of the meal planner. This will send all of the ingredients from each of the recipes in your custom meal plan to the Grocery List feature. There, you’ll find each ingredient organized by grocery store section. You can also add, delete, or adjust amounts for each ingredient in the list. When everything looks good, you can then print out, email, or download your list. We have a number of features and upgrades coming to the Meal Planner and Grocery List, so check back often to see what’s new!